I was very luck to receive the BIC Handwritten Newspaper, and I couldn't have been more excited, how wonderful does it look? To receive a handwritten newspaper, with bright colourful writing and illustrations was absolutely wonderful and the content is fabulous! The BIC handwritten newspaper is designed to encourage the nation to pick up a pen and write and this is targeted at teenagers. This newspaper doesn't include birthday cars, or reminder notes or any heartfelt messages you receive in school. It includes humours and heat warming content while being surrounded by colourful hand-drawn illustrations. This newspaper focuses on the #justwrite campaign which was designed to inspire and engage teenage readers by reminding them of the importance of writing and imagining what would happen if handwriting was lost. One aspect I absolutely love about this newspaper is how it includes aspects notes of how celebrities would feel about the world without handwritten words, and how much this means to them. As well as inspiring teenagers by expressing how important hand written words are, this also explores relevant topics such as school life, social media, friendships, sport and music which are so important for a teenager in the 21st Century. As well as this, there is a competition within the newspaper which invites readers to complete the sentence "A world without handwriting would be...". By entering this competition, you could be in with a chance of winning a share of £1,000. All you need to do is hand write your answer within the paper, take a photo of this and upload it to Tiwtter; @mybicpen using the hashtag #justwrite. How simple is that? As a student and a teenager myself, I love this newspaper. It's heart warming, funny and such a pleasure to read! I absolutely love a good read, and I do love the occasional newspaper but this makes it so much more special being handwritten. I personally adore handwritten notes or work compared to using a computer and typing something out so this was very special to my heart and I hope you enjoy it too! Now, there's something that BIC would love to do for you. 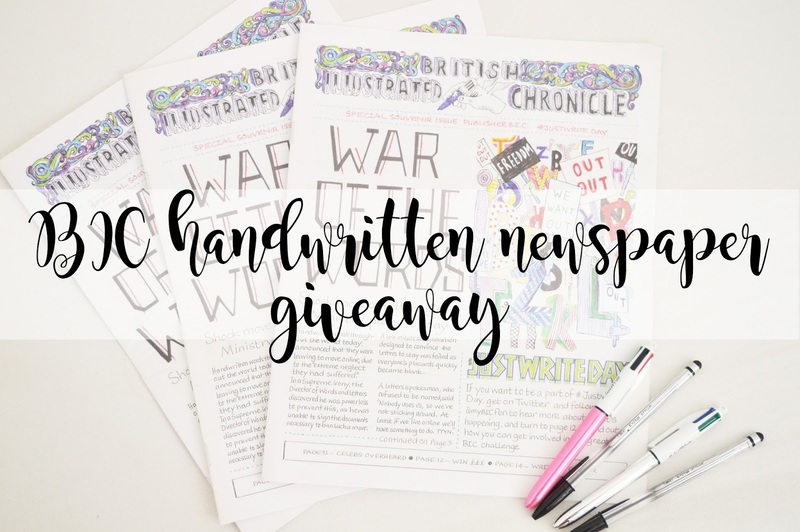 You can have your very own Handwritten Newspaper sent to you in the post, to enjoy a light-hearted, inspiring read by entering my giveaway. Follow me @kimmcpherson_ and @mybicpen on Twitter. The competition closes on the 27/09/2016 at 10am, meaning you have seven days to enter! There are also 20 Newspapers to giveaway, so you're in for a chance to win one! Good Luck! UK only. I can't wait for you guys to get involved in this giveaway and read such a lovely handwritten newspaper. Let me know if you have entered in the comments and why you wanted to get your hands on this beautiful newspaper. If you want to read the newspaper, you can also find it here. I hope you enjoyed something a little different on my blog and thank you for getting involved! Make sure to follow me on Bloglovin and my other social media links to keep up too date.